I was recently contacted by another actuary – an IFoA council member – asking for my thoughts on strategies the IFoA should think about for the future. “…. Like many other professions, I truly believe that our profession is facing a critical time given the pace of change. Going forward, I think, there needs to be a greater focus on “on demand learning/upskilling” and accessibility to resources as and when needed for learning on the job. Eg understanding and applying artificial intelligence, machine learning, blockchain, IoT, wearables, dealing with new emerging risks. The list goes on and is constantly evolving. I think the profession can and should continue to play a role in continuous ongoing learning after qualification. It increasingly seems that qualification is only the beginning and we need to be constantly learning and evolving as actuaries, to avoid getting left behind. Learning to learn and being flexible and having an ability to reinvent oneself are critical skills for the future. I believe the profession can help us stay nimble as well as fostering a culture of continuous ongoing lifelong learning. Otherwise, I believe, others (eg “data scientists”) that often have the more flexible mindset may continue to make inroads into traditional actuarial areas (eg pricing). I would like to see a greater focus on innovation and creativity as well as more training in these areas. These skills are becoming increasingly important. The insurance world is now beginning to change and “catch up” with other sectors, in terms of technology adoption. We should be aiming to claim a slice of the InsurTech pie and not just seen as the regulator checkbox guys or technicians. Let’s learn to bring more of an agile mindset to our work. I think it will be increasingly important to be able to think like an entrepreneur. Building, testing, iterating. Let’s continually learn to take initiative and find unique solutions to the new emerging business problems. Data science, especially machine learning, is becoming more and more important as a tool for actuarial work. It’s great to see the profession doing a lot in this space. Can the actuarial qualification act as a more general route into a career as a data scientist? I think it possibly can. We have a unique position in this space due to our code of ethics and highly regarded professional qualification/recognised credentials. Hence, we have a unique advantage over many others claiming to be data scientists (given anyone can now say they are a data scientist!). The problem though is the opportunity cost of learning irrelevant material (for much of data science) to get the actuarial credential. Related to the above – there’s a lot of talk about automation and people losing their jobs to robots. Whilst there is a certain amount of hype around this, I do believe automation will change the nature of many jobs in the future. Digital and automation is the future and we need to be part of that. Let’s, therefore, ensure that we continue to add value beyond the number crunching by having the skills to exercise professional judgment and business acumen whilst staying on top of developing trends. Supply and demand. I think the profession has a role to play here to help ensure this is managed carefully in different parts of the world. I believe we can possibly collaborate more with other actuarial bodies to effectively build brand “actuary” (trusted advisors of risk). 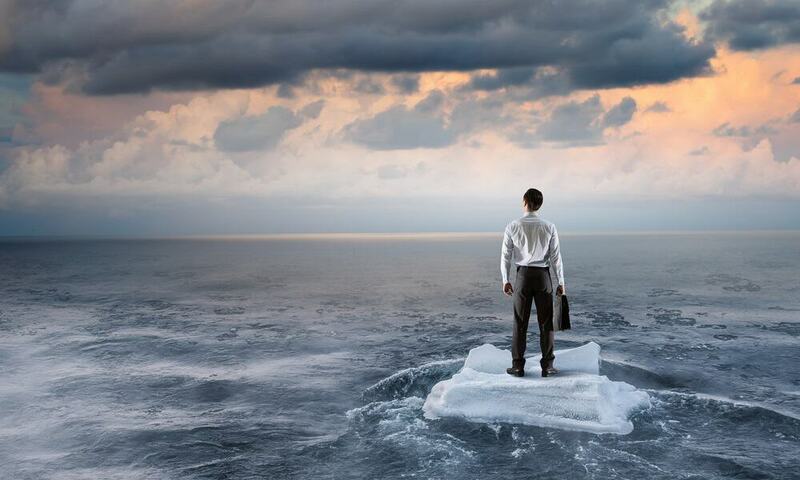 There will always be risk and especially today risk is everywhere and changing all the time. 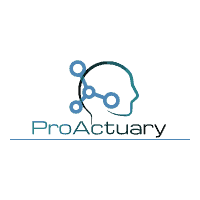 I would like to continue to see brand “actuary” as the trusted advisors in financial risk, but with more creativity and innovation. I believe one of the key positives of our profession is that it attracts really bright people. We should focus on continuing to make the profession attractive to the brightest and best. Is insurance broken and in need of rescue? That was the question I recently asked myself whilst hiring a rental car to visit the infamous “White Line” mountain bike trail in beautiful Sedona, Arizona. Many of their customers opt not to take the liability cover even though it leaves them quite exposed. A surprisingly high percentage of customers ask for a refund on their insurance payments, at the end of the rental period, if they didn’t need to make a claim! Their customers are generally very distrustful of the insurance product they are buying. Customers are often unsure whether it will actually cover their needs if they have to make a claim. Insurance is quite an unusual product. Except for maybe a coffin and a fire extinguisher, it’s the only purchase I can think of, that you make but hope to never have to use. Let’s face it. Buying insurance is usually an uninspiring ‘grudge purchase’ activity. Tedious paperwork, arcane questions, having to think about what can go wrong in your life. Is it any wonder that the experience is up there with a visit to the dentist? Of course, the reality is that should your home be destroyed in a storm or should you be involved in a car accident deemed to be your fault (especially with third-party injury) insurance can be the saving grace preventing potential financial ruin. After going through the pains of considering the potential financial impact of personal tragedy, you are rewarded with the end product…a paper contract. Not just any old paper contract, but a long-winded, very conditional and often confusing document. How exciting! Again, is it any wonder insurance customers can’t or don’t want to take the time to understand the precise nature of what some deem to be the world’s most boring product? Whilst the quoted source may be a parody, I believe the underlying inclination signifies the typical level of distrust that consumers have of insurance. Don’t get me wrong. 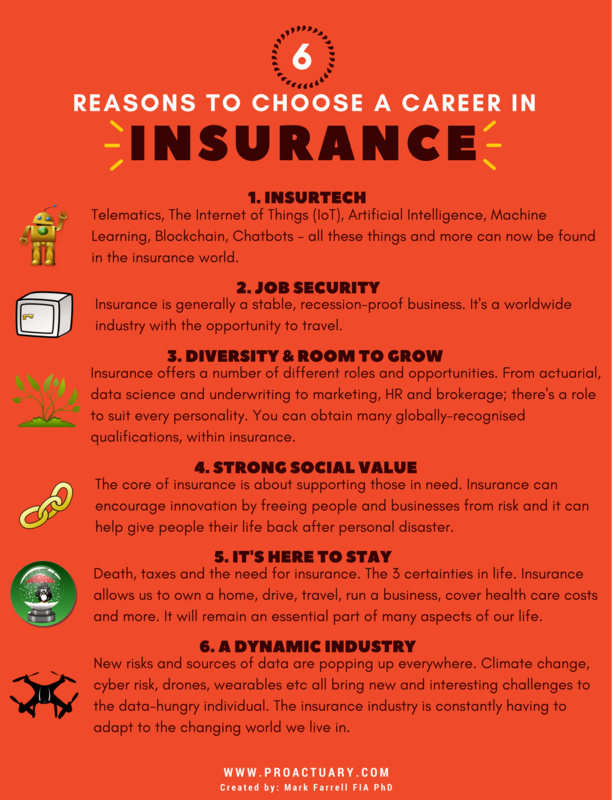 I believe insurance plays a critical role in our lives and insurance companies can provide a great service as well as a very rewarding career path. But, when it comes to the general consumer view of insurance there seems to be an issue. Telematics has been around for a few years now. Particularly in Italy, the UK and the US. Onboard car technology is used to monitor and potentially assess the driving behaviour of each individual driver. Thus moving insurance from a pooled pricing model to a more individual specific model. One where the underlying policyholder risk is more closely monitored. This information can then be considered in a more accurate and individualised pricing model. One that potentially allows the previously trapped (i.e pooled) policyholder to break free from his or her age or gender (non-EU) status etc and prove their worth as a safe driver that is a good risk and unlikely to have an accident and hence claim. As well as young male drivers, low-mileage drivers also benefit and this is the market which Metromile have targetted. The usage-based customisation of insurance certainly seems to be keeping their customers happy with policyholders reporting they feel like they are getting a fairer deal. After all, should a low mileage, safe driver really be subsidising a riskier high mileage driver just because they share common old-school rating factor characteristics? Metromile have been forging ahead with this lifestyle app-based continuous digital engagement model since 2011. And they show no signs of slowing down. In late 2016 they raised US$192 million in funding through which they acquired a carrier enabling them to now underwrite their own policies. Trov provide on-demand insurance for personal items that can be toggled on and off via a few simple taps from your phone. They aim to provide the mobile generation with easy protection which they can enjoy “without worrying about rigid policies and confusing fine print”. 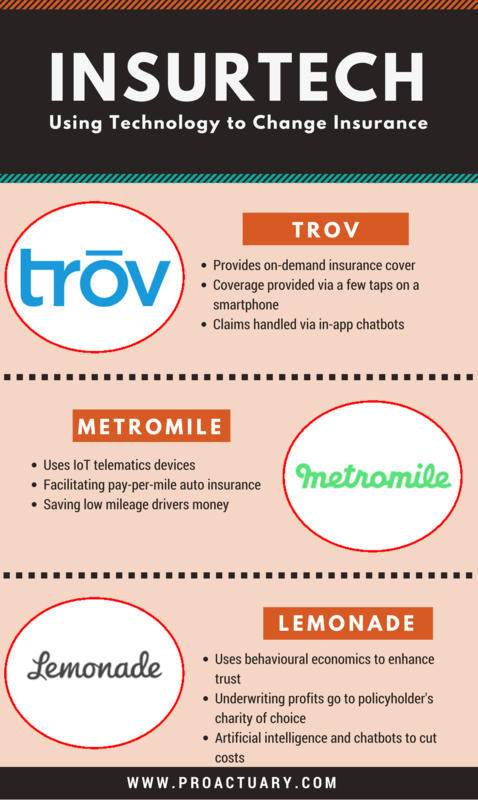 In addition, Trov seems to be jumping on the personalised cover bandwagon – treating policyholders as individuals instead of an average risk within a cohort. Their flexible app gives customers the option to tweak their cover towards their own personal circumstances. As one customer put it: “Why pay for an expensive insurance plan designed to cover your worldly belongings when all you really care about is your mountain bike and your laptop”. This simplicity and flexibility seems certain to appeal. I personally like the idea of being able to quickly and easily protect my mountain bike by getting temporary insurance for the times when I do actually take it out and use it. And if a claim is required, it’s all handled via an in-app chatbot. Insurance for the smartphone generation indeed! Whilst I do wonder how they counter fraud (given the ability to so easily turn the cover on and off), as we are living in the age of convenience, it would seem that this model is sure to appeal beyond just tech-savvy millennials. The poster child of InsurTech. Or at the very least the king of savvy InsurTech marketing. When they shout about paying a claim in 3 seconds, using AI not actuaries and bots not brokers it certainly makes one stand up and take notice. Lemonade began selling insurance nearly 2 years ago and have now amassed a sizeable level of funding and following. They promised to bring trust back into the insurance world – the way it should be and how it was in the beginning. The tools of their trade: behavioural economics and artificial intelligence. Their promise to the end customer: simplicity, convenience and affordability. All done under the guidance of highly regarded chief behavioural officer, Dan Ariely. But back to the trust issue. How is Lemonade approaching it? Their business model attempts to disrupt the cycle of distrust between insurer and insured. This is done by separating the pool of risk capital from the company’s own 20% flat fee. Essentially this model aims to remove the incentive for the insurer to minimise claim payouts on the basis that doing so will not affect their bottom line (the remaining 80% claim pot gets paid out to small peer groups under a ‘giveback’ scheme, after some unavoidable expenses such as reinsurance cover). Basically, the deal is: Trust us to pay out your claim quickly, with minimal fuss and without any sneaky “catching you out in the fine print” shenanigans and we will trust you to only claim if it’s genuine. The behavioural implication, with the removal of potential conflict, is that the enhanced 2-way trust will drastically reduce fraudulent claims. 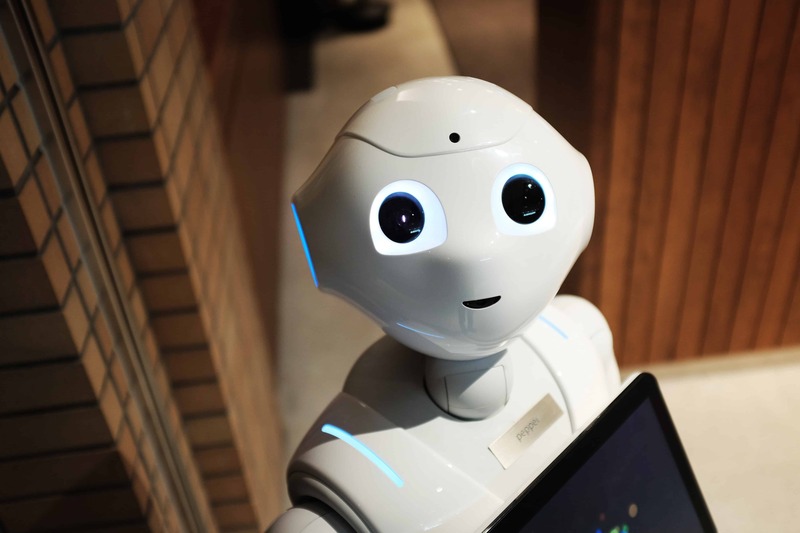 This, combined with the operational cost efficiency savings from AI and technology will allow the company to have happy customers and still make a sustainable profit. Now, whilst I love what they are doing, I’m not entirely convinced their model is altogether different from some of the smaller mutuals. Especially those that still maintain some level of social bonds. Maybe I’m biased because they don’t seem to like actuaries, but I also wonder whether their pricing, underwriting and risk management will allow their loss ratios to stay low enough to not impact on their 20% flat fee over the long term. It takes some time for reality to test the theory, in insurance. So I, for one, will be watching the Lemonade space with interest. So is insurance really broken and in need of fixing? Firstly, let’s not forget what insurance is all about. In essence, insurance is about the pooling and sharing of risk. Swapping an uncertain, and potentially large, outgo for a small(er) more certain outgo (the premium). This is unlikely to change and insurance companies obviously already do this. But, I do believe, there is a need to modernise, especially in relation to the customer experience. I don’t see InsurTech companies causing a complete revolution. But they are likely to play a big part in the ongoing insurance evolution. What do you think? 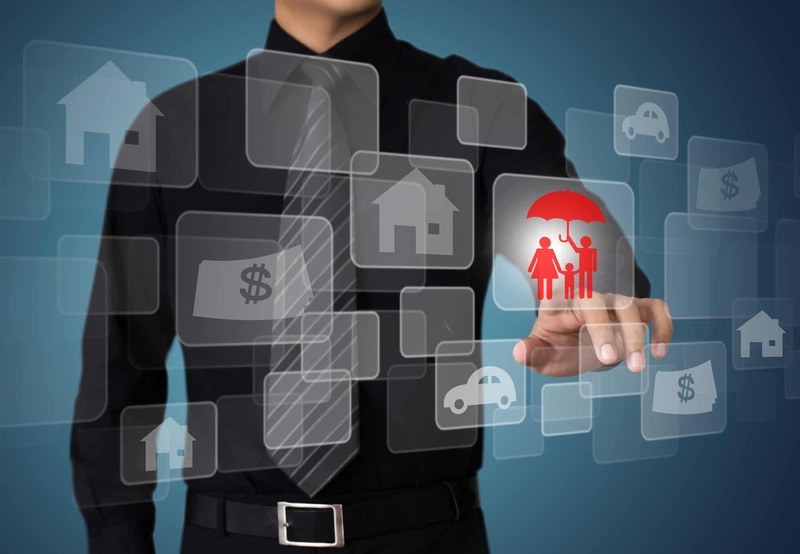 Does insurance need to evolve? Is InsurTech the answer to the customer experience issues? Are these InsurTechs all marketing talk and lacking substance? Will the asset rich insurance incumbents ultimately lead the way in the unfolding tech world evolution? In 2017 I spent 6 months on a Fulbright scholarship, in the desert heat of Phoenix and Tempe at Arizona State University. This was also the location where Uber and Google’s Waymo decided to test their artificial intelligence powered driverless cars. Watching and driving alongside these “computers on wheels” I was fascinated by how they interacted with their surroundings, seemingly just like any other vehicle. Aside from the large sensor on the roof they didn’t act or look much different from other vehicles navigating the city. My 3 kids, sitting in the back, would often joke that the robot car was coming for us. Yet they braked and accelerated smoothly, stopped at red lights and didn’t even honk at any of my bad driving behaviours. Robots driving cars! If you had told me 10 years ago that I would be living and driving in a city alongside robotic cars I would have said it was pure science fiction. But it seems we are now indeed living in a different world. One that is leveraging technology, especially AI, to change our lives at an exponential rate. It feels like Moore’s law has run amok. Just think, for a second, how driverless vehicles might change the world – reduced car ownership, car design radically changing towards comfort and luxury, more senior drivers, reduced taxi/bus/truck/delivery drivers, hospital and emergency services unburdened and huge improvements to rush hour traffic – to name just a few. Of course, the diffusion of new innovation is in reality never linear and straightforward. For example, Uber’s self-driving cars have recently come under huge scrutiny following a tragic accident where a pedestrian was killed, whilst crossing a road, in Tempe. Tragic as this was, I still believe that autonomous vehicles are much safer than human-controlled vehicles. Sure, the underlying AI neural nets may not be 100% robust to cope with all situations, but let’s not forget that 100 people die per day in the US in an auto accident with human drivers behind the wheel. At the time of writing, Waymo’s autonomous fleet has self-driven more than 5 million miles without a fatality. In my opinion, the researchers that are predicting vehicle autonomy will create a 90% reduction in accidents by 2050 are probably not far off the mark. So what does this mean for actuaries? Naturally, the auto insurance world is going to get turned upside down as these vehicles become mainstream. 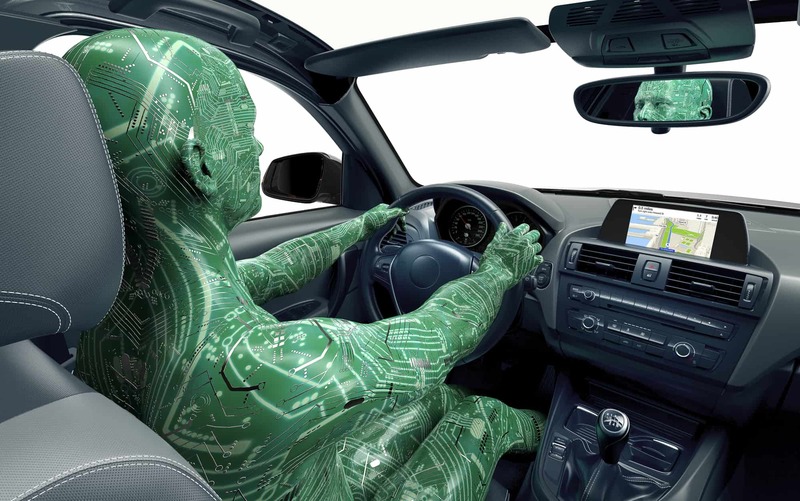 Considering it’s estimated that more than 90% of road accidents today are a result of human error, personal car insurance will be redefined as risk shifts from vehicle users to vehicle manufacturers and software/hardware suppliers. As the inevitable driverless world takes over, many traditional auto-related risks will no longer be as prevalent. Risks such as those caused by reckless or distracted driving, speeding, running stop signs/red lights, unsafe lane changes, tailgating and road rage will be replaced by new emerging risks such as malfunctioning software and cybersecurity. 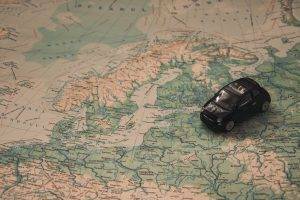 The migration and ensuing calculation of risk will be particularly challenging during the “chaotic middle” transition period where vehicle owners and the AI software share responsibility for the vehicle’s operation and any resulting liability. Given the number of deaths attributed to vehicle accidents at present (over 1.2 million people die in road crashes each year, on average 3,300 deaths a day) mortality curves may also eventually be significantly affected. For example, the spike in mortality rates that we currently see around the late teens/early 20s (the “accident hump”) may start to flatten out. Risk, and hence insurance, is the playground of actuaries so surely they will be at the forefront of untangling and understanding these uncertainties as the autonomous vehicle landscape unfolds. Every year I give a number of talks to students interested in a career in Actuarial Science. At times I’ve been asked questions, similar to the above, regarding the insurance industry. I’ve summarised most of the points I usually touch on, in the infographic below. Would you agree? Anything else to add? Help me to sell a career in insurance to the next generation of actuaries! Can the Actuarial Profession Survive? 1. Qualifying as an actuary is great…BUT it is no longer the golden ticket to freedom and security. To continue to succeed, we can not afford to stay still. To thrive or even just to survive, we must continually be improving, both professionally and personally. We must master the art of learning. ‘Learning to learn’ efficiently and effectively is a key skill in this ultra-competitive world. Not just for passing actuarial exams, but for lifelong upskilling. 2. Opportunities and choices are everywhere. We are overloaded with information and distraction. Focus is the new currency. We need to improve our ability to cut through the noise, make optimal decisions, work efficiently, avoid distraction and learn to ‘hack’ the system – all whilst staying healthy and sane! Psychology, technology, awareness, smart learning, leverage and a commitment to lifelong study are key tools in this battle. 3. Technology, InsurTech, big data, data science, blockchain, machine learning, AI, IoT, etc. All these things are changing the world, at an ever-increasing rate. Actuaries should be keeping aware of, embracing and taking advantage of these opportunities. 4. We are all in the game of marketing and sales, whether we like it or not. To some extent, we need to be able to effectively sell our employer, our ideas and of course ourselves. 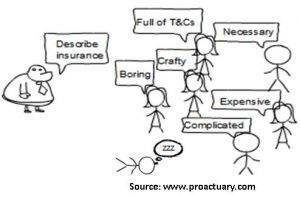 Actuaries are known for their introversion and hence this can often be a weak spot. But it can pay huge dividends if we overcome it. Many of my actuarial students are interested in data science. 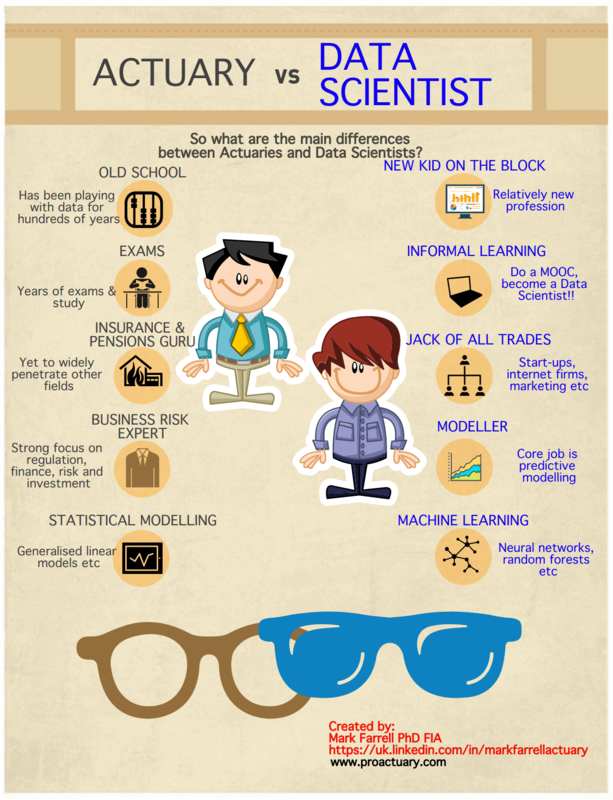 They often want to know the main differences between actuaries and data scientists. It is my belief that actuaries of the future will incorporate a lot more data science into their day to day jobs. Many actuaries should, therefore, be learning more about how to deal with extremely large datasets and how to use machine learning techniques and be able to, when necessary, move beyond more traditional statistical methodologies. This infographic is my take on some of the key differences between the 2 fields at present. I think the differences will become more blurred over time. This was originally posted on LinkedIn and generated some very interesting debate (155 comments). Adverse Selection: Friend or Foe? As big data continues to increase, the insurance world seems to be moving towards more individualistic, granular pricing. Consider ZhongAn, in China, for example. As an innovative digital insurer, utilising big data to its full extent, they are focused on micro-pricing premiums in a very personalised way. With more than 460 million customers acquired over the last 3 years, their digital and individual risk assessment approach seems to be working. But is this move towards more individual risk-pricing a good thing from a societal point of view? The insurance industry has traditionally claimed that not being able to accurately price insurance products, with regard to individual risk, will lead to the adverse selection spiral as the low-risk individuals in the pool reduce or forgo their insurance. However, UK actuary, Guy Thomas, challenges this orthodox view by contesting that some adverse selection (and hence some restrictions on risk classification) is beneficial from a public policy perspective. I have reviewed his, recently published, Loss Coverage book for The Actuary magazine. Do you agree that some adverse selection (and hence restrictions on risk classification) may be beneficial for society as a whole? Or should insurers always be aiming for an “actuarially fair” premium?